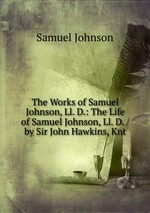 Аннотация к книге "The Works of Samuel Johnson, Ll. D.: The Life of Samuel Johnson, Ll. D. / by Sir John Hawkins, Knt"